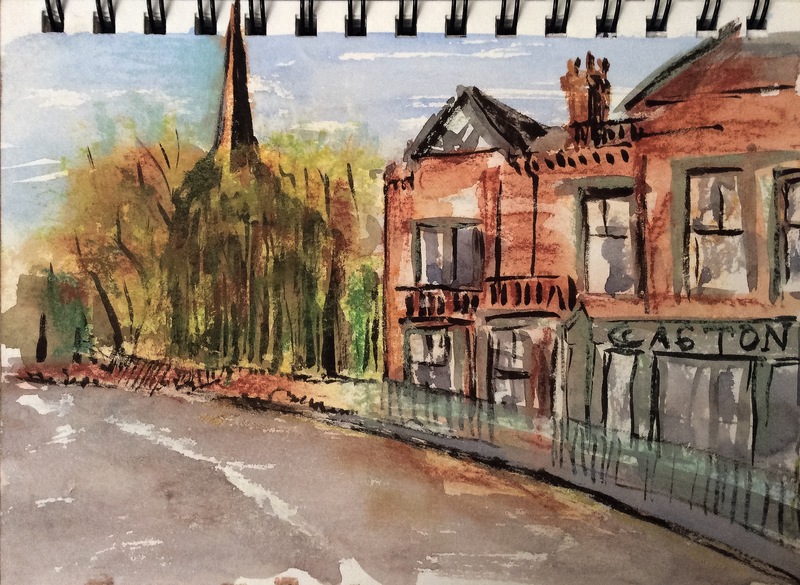 Last Saturday I joined, for the first time, the Birmingham Urban Sketchers Group. 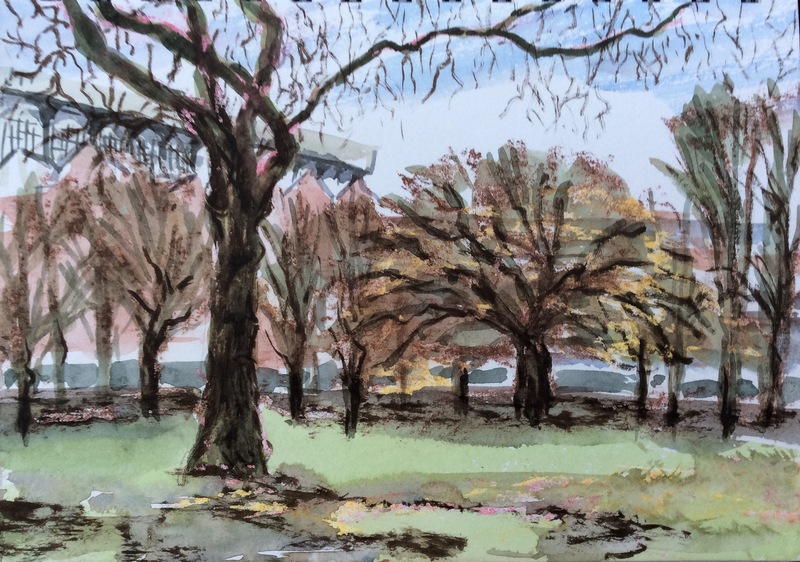 The location was Aston, following a road past a Seventh Day Adventist chapel and low-rise residences against which autumn leaves piled high in drifts, under the expressway to the park and Aston Hall museum. 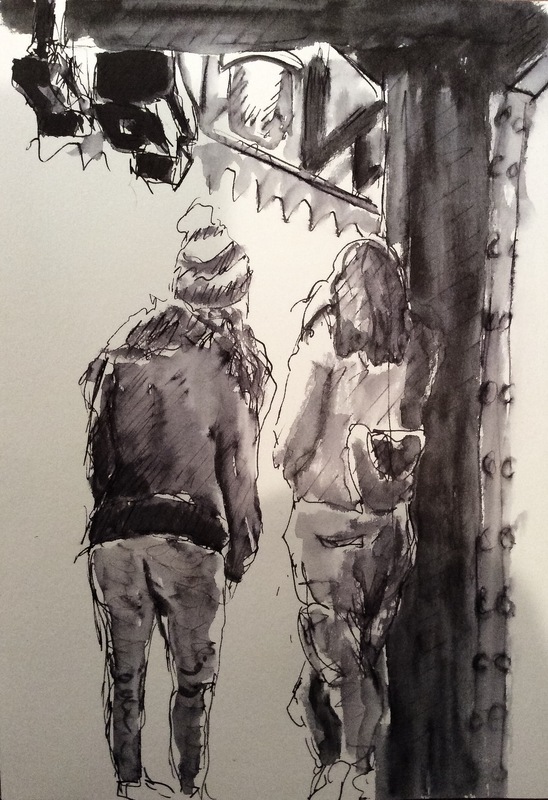 Arriving late, on the coldest day of the year so far, I found other sketchers dotted about, hunched against the wind holding down their drawings. The expressway rises to sweep over the residential streets. The Aston Tavern proved a surprising haven in this urban environment, with log fires and good beers and classical music playing on the background. Behind this is the parish church, with tumbling memorials leaning against one another in the graveyard. 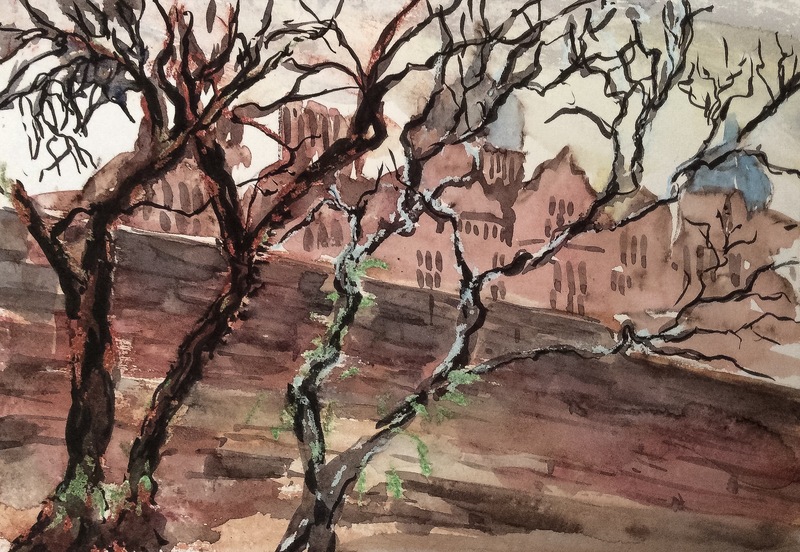 I walked round the outside of Aston Hall (a large Jacobean manor that had been besieged by Parliamentarians in the Civil War) and looked down stone steps through trees to the Aston Villa stadium dwarfing the surrounding dwellings. We finished in the Eritrea Café, a late Victorian building, surmounted by a statue with helmet and trident, formerly the Britannia pub and for while used as a cannabis factory before its latest incarnation. 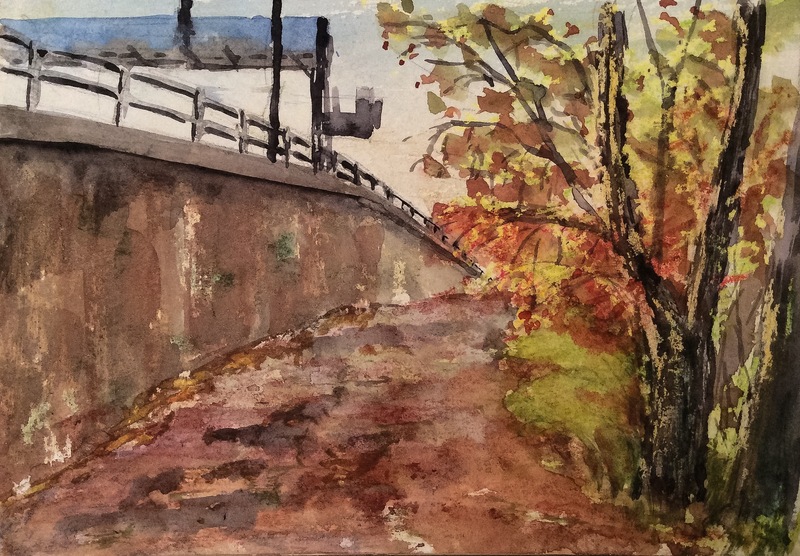 I drew using my current field kit: conte crayon as initial layer and resist for subsequent watercolour. The drawings of the other sketchers can be seen on the group’s Facebook page. Thanks for the comments on the previous version. In response I abandoned any attempt to reference the photograph I shot on the same day as this painting was first sketched out. I kept changes to a minimum: dropping the skyline to give more explanation to the background coastal hills, smoothing out some texture in the bottom left corner to link better the two halves of the image, scouring back some of the intense white of the nearest sea to reveal colours beneath and selectively glazing the foreground in acrylic to give more shape to the overgrown rock surface and reduce the brightness of the whites. I now call this a finished piece. 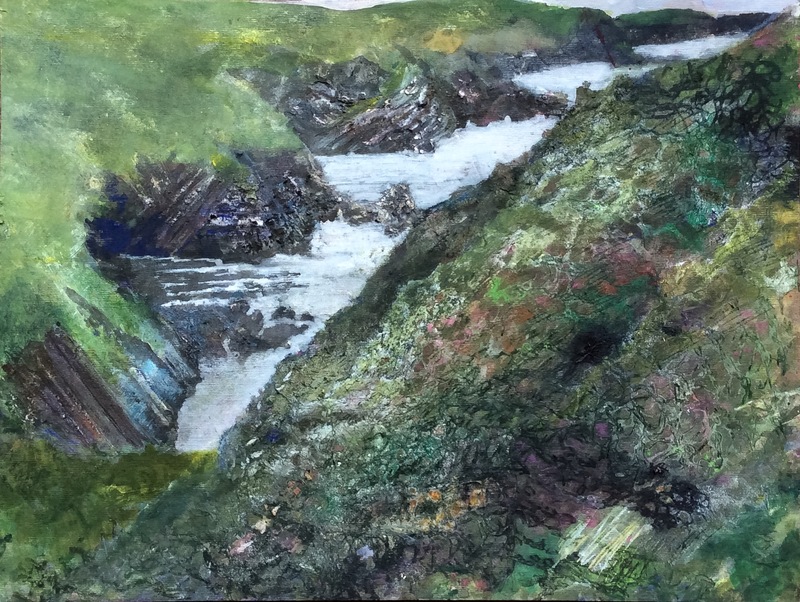 This is how this picture now sits after working into the distant moor and cliff faces with sandpaper, knife, pumice, washes of sepia ink and a dusting of conte crayon. I have accentuated the highlights of the water and brought the tide further inland. The next challenge is the foreground which needs more respect. I like the textures that arose from the netting but want to wash over the white and bright green, and shape the near slopes more. I need to unite foreground and background into one image and that means, in part, stripping off the clean white sea I seem now to have painted. I have a photo showing grass heads – but how much now should I follow the photo? 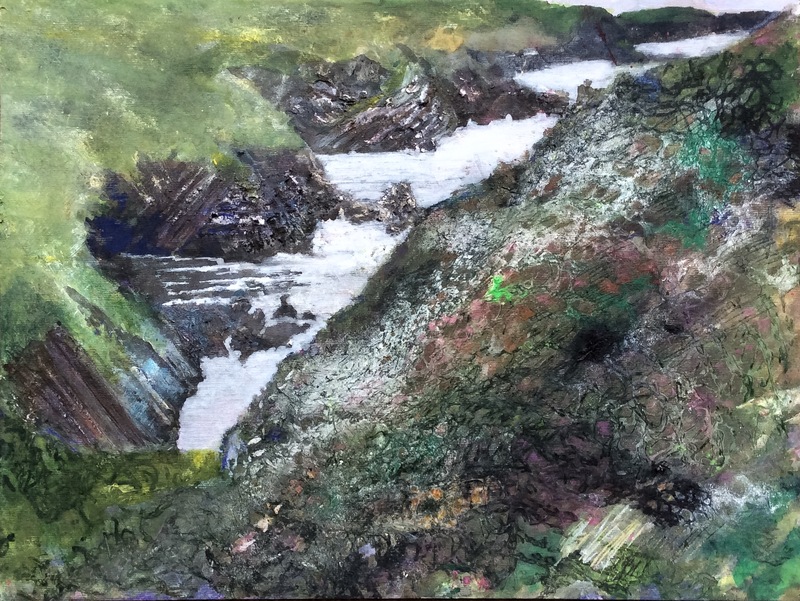 Here is a gallery of images of this one scene on St Abbs Head in the Scottish coast, drawn originally in July 2013, some original field sketches and some in various stages of re-purposing. Ravenshaw Lane is on a regular short cycle route for me, one I usually take when light is failing but I need to get out for an hour or so. At one end is an industrial unit, set in parkland, making large metal waste tankers called whales. The lane is tarmacked at either end but in the middle dwindles to a footpath and a narrow wooden bridge across the river. Standing on the bridge, I watched the fading sunlight filter through hanging rusted foliage in a garden above the brook. I managed only to get the bones of this sketch onto paper before darkness fell. I finished it at home from memory. 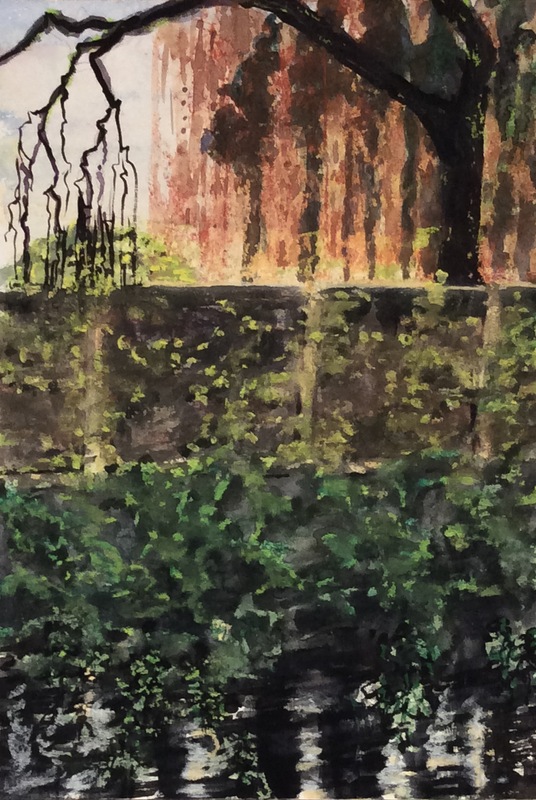 Initially, I drew in the fence posts and plants scrambling up the bank and fence in high key, but muted them as the what light there was came from behind the fence: I wanted to emphasise the backlit curtain of brown foliage. This was drawn in conte crayon then watercolour laid over this. The next day, I went to Liverpool. I have been privileged to be the person who has taken an exciting piece of science into the clinic. The whole project, from its inception long before I was involved through to the current trials, was recognised with a prize.